Timeless books, newly designed and typeset for modern readers! Browse our books at Barnes&Noble. Bookstores and libraries: Please order our books from Ingram Book Company. If you don't have an account with Ingram, you can order from Amazon by calling toll-free 866-308-6235. 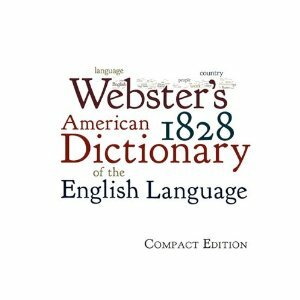 Webster's 1828 American Dictionary of the English Language: 4.4 pounds, A4 size, 826 pages, newly typeset in a large paperback format for the affordable price of $39.95! To make Webster's monumental 1828 dictionary available at a more affordable price, this new edition has been carefully prepared in a proprietary compact format: All of the words, definitions, and examples have been preserved, but the explanations of word origins have been omitted to save space, as has Webster's lengthy technical introduction. Scripture references have been standardized in modern format, and many abbreviations have been spelled out for greater understanding. Also, for the first time since the book's original publication, the text has been newly designed and typeset; the clear, sturdy Charter typeface makes the text highly readable in spite of its small size. Noah Webster's 1828 American Dictionary of the English Language is a work of great importance for modern readers who care about traditional values. The founding documents of the United States of America are contemporary with this 1828 dictionary, as are many other important books and documents of that time. The 1828 dictionary defines the language of these materials in the context of their era and thus becomes a valuable reference tool to enhance understanding. In addition, Noah Webster based his work extensively on the King James Version of the Bible, so that not only the words but also the values of the early nineteenth century are reflected in the definitions. As Webster wrote, "In my view, the Christian religion is the most important and one of the first things in which all children, under a free government ought to be instructed. . . . No truth is more evident to my mind than that the Christian religion must be the basis of any government intended to secure the rights and privileges of a free people." This new, compact edition is published with the same hope expressed by Webster himself: "I present it to my fellow citizens, not with frigid indifference, but with my ardent wishes for their improvement and their happiness; and for the continued increase of the wealth, the learning, the moral and religious elevation of character, and the glory of my country." Copyright© 2007 by The Editorium, LLC. All rights reserved. Contact us by .